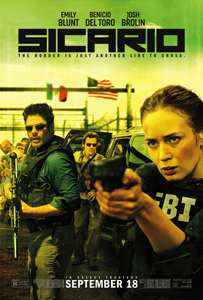 From the creator of 2013’s Prisoners, and getting ridiculously high critical acclaim, but Sicario is no Prisoners. An FBI agent who stumbles upon the dealings of a drug cartel is roped into a special Government taskforce to aid in the neutralisation of the drug trade on the US and Mexican borders. I don’t get the massive critical success of Sicario. I really don’t. While director Denis Villeneuve really has his stamp upon it stylistically; it has the same perpetually moody, grim and intense atmosphere, as a story and as a film it really doesn’t do anything. Emily Blunt leads the cast as Kate Macer, an FBI agent who we see in the film’s opening stumble across a house where the walls are lined with corpses. This opening is, frankly, the best and most interesting part of this entire film. There’s a real sense of dread, a sense of putridity and cruelty that is amplified by the film’s score. The film grabs you instantly, but it slowly loosens its grip. Kate Macer quickly becomes a non-character. She has vague motives at best to help this taskforce, and they (led by Josh Brolin) do not tell her anything; everything is deliberately kept secret from her. Why? That would be the film’s anchor, the meat of the story is how this unit alienates and treats her like a ghost. It would be, had the film actually led to anything worthwhile. On top of this, Emily Blunt can play a strong female protagonist, yet here her character is made to be virtually useless; she even nearly accidentally sleeps with a villain. The mystery of why she is even in this brutal, dangerous place becomes more of a nuisance than a compelling reason to watch. The film’s perspective moves gradually away from Macer completely, and towards Benicio Del Toro’s character Alejandro, who is a quiet, seemingly unassuming man within the taskforce who when asked refuses to say who he works for. There’s an uncomfortably long stint where we are following a woman we know nothing about, following a man she knows nothing about, for reasons we don’t know. And like I said, the film ends with very little pay off for all this mystery. The film’s opening is fantastic. It really, really is. The score, Blunt and Del Toro are also all incredible with the roles they play in the film. The music is unsettling and make the omnipresence of threat from all directions palpable; the film’s sense of dread is incredible and does test your wits and drains your resolve. But it drags itself down with a over reliance on mystery and it loses the audience. Fans of Prisoners might be expecting a twist or two that never come, or audiences are put out by characters we don’t especially care about. I criminally underrated Prisoners, and I would rather watch that again than Sicario.